Hands up who believes in ghosts? And hands up who’s seen one, or more? Where’s the spookiest place you’ve been? With so much legend and history here in North Wales and Snowdonia, there’s no wonder that we’ve got our fair share of ghosts and ghoulies – in stories at least. Porhtmadog is said to have it’s fair share of spooky presences – from the ghostly spectre said to haunt the shop floor of Kerfoots, the once famous department store to the spirits of captains said to roam the harbour walls. 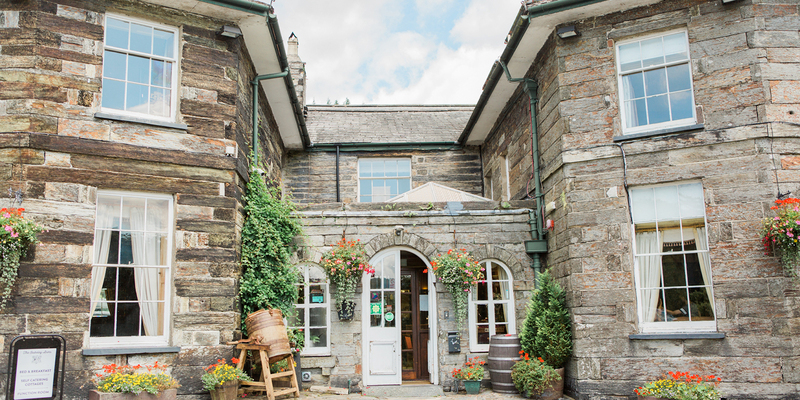 And just a stone’s throw from us here at the Oakeley Arms is the 500 year old manor house Plas y Dduallt (which literally translates to House of the Black Hill – a spooky name in itself…..). The manor house has strong links with Llywelyn the Great and Oliver Cromwell, and is frequently featured on the spooky television series Most Haunted. One town in North Wales that is eerily spooky is the town of Ruthin, about an hour’s drive from us here at the Oakeley Arms. With its eerie gaol, crumbling castle and historic town square, it isn’t difficult to imagine Ruthin in its bustling medieval heyday, when public hangings and daily executions were commonplace. Does the ghost of the Grey Lady still haunt the halls of Ruthin Castle? And how many tragic spirits of past prisoners will you encounter in the depths of the gaol cells? Can you imagine the last cries of a desperate criminal as he’s marched to the gallows in the town square? And how can the ghostly wail, piercing the walls of the Old Courthouse, be explained? And just over the border is the beautiful ancient city of Chester. It may seem quaint on the outside, but dig a little deeper and there are sinister stories and ghoulish goings on that will delight any fan of a ghostly tale. Since the city of Chester was built as a Roman fort nearly 2,000 years ago, it’s been home to Celtic warriors, Saxon armies, Norman invaders and groundbreaking technology during the Industrial Revolution. It’s no wonder that this historic little city is also home to plenty of ghosts and spirits. Swept away into the dark and narrow streets, the creaky medieval rows, archaic inns and deep into the city walls and alleys are some of the cities spookiest stories. There’s the mysterious tale of the disgruntled pub landlord, who was fiercely protective of his pub, Ye Olde Vaults on Bridge Street, and the eerie sightings of two ghostly monks on Pepper Street. The chilling story of the soldier from WWI who marches along the old site of the Chester Royal Infirmary looking for his missing uniform is enough to send shivers down the hardiest of spines, and the tragic tale of a young girl who hung herself to escape from the terrors of the workhouse comes alive at a Victorian bakery on Bridge Street. Chester also claims to have the oldest ghosts in the country. Apparitions of Roman soldiers appearing in the amphitheatre have been reported, along with the deathly thud of marching feet on an ancient city road.